Sam Chupp | Kris Johnson's Blog…sort of. Recently, I spouted a series of “facts” about some of the folks I converse with on Twitter. In their original form, these all contained 140 characters or less. For ease of use today I have expanded the names of the Factees, so some individual facts may exceed the 140-character limit. BONUS QUEST: Savvy readers might be able to determine the impetus for this exercise in lunacy if they examine the list carefully. FUN FACT: Sam Chupp has not one but two arms, each with a five-fingered hand at the end. Individually, the hands are incapable of clapping. FUN FACT: Jared Axelrod can go from clean-shaven to a goatee in seven minutes flat if he concentrates. 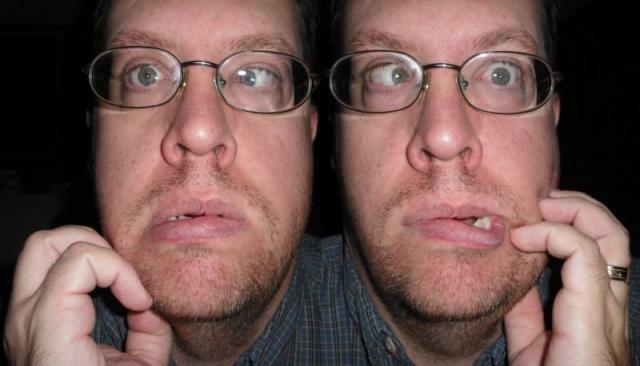 FUN FACT: Chris Miller once stabbed a minor Internet celebrity in the face…WITH HIS EYES! FUN FACT: J.C. Hutchins loses all his super powers if he sees the color chartreuse, but only if it is actually Pantone® 14-0445. FUN FACT: Contrary to popular belief, Bob is not married to the daughter of a prominent Mafia Don…ANYMORE. FUN FACT: Evo Terra would just as soon kill you as look at you, but in actuality HE DOES NOT WANT TO LOOK AT YOU. FUN FACT: Kris Johnson had a triple-shot venti mocha from Starbucks after lunch, and now his BRAIN IS ON FIRE. FUN FACT: Ken Newquist has never been within arm’s length of an extraterrestrial being, but only because he has RIDICULOUSLY SHORT ARMS. FUN FACT: Ivan has a removable face, used to switch expressions and show emotion, but he never changes it because he is ALWAYS ANGRY. FUN FACT: Mur Lafferty once wrote a romance novel under the pseudonym Karyn Van Heusen. The title: LOVE’S FORBIDDEN FILLING. FUN FACT: As a master of several forms of martial arts, Jason Penney knows 114 ways to immobilize a man, seven of them using JUST HIS GILLS. SECRET BONUS QUEST: If you are extremely observant (and I suspect you are), you have already noticed that each of the names mentioned above is actually a hypertext link to another area of the Interwebs altogether. If I were to suggest that a CODED MESSAGE can be revealed by reading the fifth word of the most recent blog post (as of 18 January 2009) at or near each of these locations, I WOULD BE LYING. If I were to suggest that the first person to embark upon such a wild goose chase and comment here with the unscrambled message might win a prize of not-insignificant fabulosity, THAT WOULD ALSO BE A LIE. You should not do this. There is no message. There is no prize. Any effort you expend in attempting to glean such a message in order to attain such a prize would be UTTERLY WASTED. I am absolutely not kidding. Once again, I have been tagged to enumerate some random tidbits (factual, one presumes) about myself. The magic number here is sixteen and the tagger was none other than Chris Miller. My most recent meal (as of this writing): four sliders and half an order of Not-So Fries at Yours Truly. This is just part of the reason I’ve found the weight I lost last summer. I play with my wedding ring a lot; it drives Laura nuts. On long trips (such as driving up to my parents’ house), I occasionally take the ring off and place it on the little joystick for adjusting the side mirrors. I often take it off or switch it to my pinkie finger when I’m typing. I still have my tonsils and they are ginormous, even more so when they’re infected (which seems to happen once or twice annually). The first Star Wars film I saw in the theater was Return of the Jedi at the Lode Theater in Houghton, MI. I was a little concerned that my eight-year-old brother, Adam, might not be able to keep up with the subtitling of Jabba the Hutt’s dialog, but I don’t think he had any problem with it. After the movie, we ate dinner at the Douglass House across the street. As we were leaving the restaurant, I realized I’d left my jacket in the theater, so went in to retrieve it. Luke and Leia were chasing scout troopers on speederbikes and I found my jacket with no trouble. I once lived in an apartment above a video store and still could not return a rented movie on time, even though I could have easily dropped the tapes through the hole in my bathroom floor directly into the video store. The last time I assembled one of these lists, my wife indicated that she could come up with seven weirder things about me than I had. She has yet to deliver. 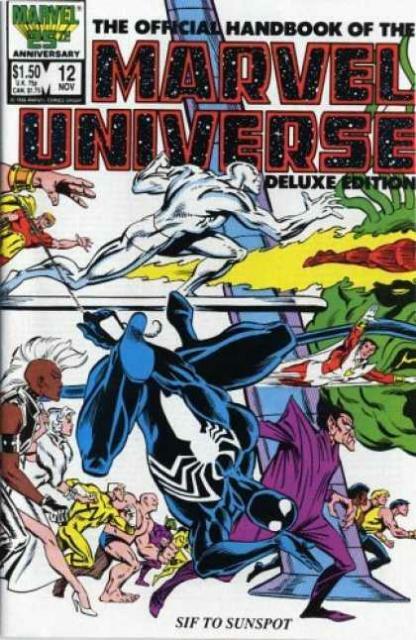 I still remember the cover of the issue of The Official Handbook of the Marvel Universe Deluxe Edition my mother bought me the day I got my first pair of glasses, way back in elementary school. The feature that I remember most distinctly: Stilt-Man’s leg, which is the only part of the villain visible on the cover and extends up beyond the boundary of the image. I have smoked precisely one cigar in the thirty-five and a half years I’ve been on this planet. I do not intend to smoke another, no matter how many more years I remain here. I once stuck my tongue on a metal handrail in the middle of winter. I was at school and had snuck outside, so no one knew where I was. After a brief bit of panic, I tore my tongue loose, and the next several meals I ate were incredibly unpleasant. I didn’t tell anyone about it until years later. If I were compiling a list of United States I don’t feel compelled to visit, I would probably put Idaho at the very top, but only because I’ve already been to New Jersey. I spent two weeks trying to “hack” a broken copy of Hacker II: The Doomsday Papers for the Apple //GS before giving up and calling Activision Customer Support only to learn that the game was not supposed to boot to a command prompt after all. They sent me a replacement copy and I eventually beat the game. The only items of clothing I have purchased for myself since getting married are hats, gloves and winter boots. I will probably purchase a pair of gloves on the way home from work today. I always put my shopping cart in the corral; if there’s no corral, I’ll return it to the store. I do this simply out of a desire to feel morally superior to those people who leave their carts in the middle of the parking lot. 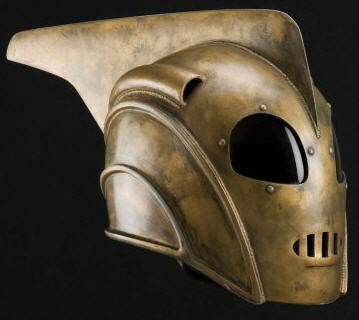 I think The Rocketeer’s helmet is one of the coolest things ever. If I could have one accurate replica prop from a movie, that helmet would be it. If I could have the entire costume, I might never take it off. It was a list like this one that convinced Laura she needed to introduce herself to me more than fifteen years ago. I often clean my glasses in the morning with the underwear I am about to don. The cloth is clean, soft and apparently lint-free, so it’s pretty much perfect for the job. I’m well aware that this is probably something you neither needed or wanted to know, but that’s the risk you take when you read one of these lists. Let it be a lesson to you. Do I even know sixteen people to tag? Let’s try Jason Penney, Rachel Ross, Eric Feldhusen, Rae Lamond, Eric Bork, Sam Chupp, David Moore, The Bearded Goose, Sudrin, Jude, Not Andrei, The Cynical Optimist, Wesley, Jaxvor, Slowhand and Laura Johnson. Yes! Laura Johnson, who does not have a blog. Get one! Your husband can help! Non Sequitur: Seven Random/Weird Things. About Me. I’m going to ignore rule number four, just because I don’t like leaving comments that aren’t related to posts. Seven things, eh? Random and/or weird. Oh, I can handle that. FACT: I can cross my eyes independent of one another. FACT: The first compact disc I ever purchase was from a group named Holiday Ranch. I split the cost of the CD with my friend, Eric, because I didn’t own a CD player at the time. I have no idea where that disc is today. FACT: I created my first web page in the early 1990s while working as a “lab consultant” at the Center for Computer-Assisted Language Instruction at Michigan Technological University. The only content I can specifically recall was a scan of an Arlo and Janis comic strip. Yes, my first web page prominently featured copyright infringement. FACT: I am a founding member of the Benevolent Order of Scrimshankers. FACT: I do not like cold Swiss cheese. FACT: I once dreamed that I was being pursued by Darth Vader, who was driving a white van and intended to cut my legs off when he caught me; it has been at least twenty years since I had that dream, but I still remember it quite clearly. FACT: I have never seen any movies in the Godfather or Rocky series. I actively avoid the latter. There is no rational reason for this; I just do. Now, to the tagging of others. Chris Miller. This one is a total cop out, as Jason already tagged him. One of the things I like about WordPress 2.5 is the native support for Gravatars, globally recognized avatars. The idea is pretty simple: register with your e-mail address at the Gravatar site, upload a picture (I used a photo of myself, but that’s not a requirement). Once your account is set up, anytime you leave a comment on a Gravatar-enabled blog, your e-mail address is sent (using the magic of cryptographic hashing) to the Gravatar server. The server then does what servers do best: it serves; specifically, it serves your globally recognized avatar to the requesting blog, which then (typically) displays said avatar next to your comment. Each Gravatar has a content rating—G, PG, R or X—and WordPress has a “Maximum Rating” option that determines whether Gravatars of a given rating will be displayed. I try to maintain a family-friendly blog for the most part, so I’ve set the Maximum Rating to PG, which won’t prevent people with photos of “Lando and the Ugnauts” as their Gravatar from commenting, but will prevent said photo from displaying next to their comment. Seriously, put that thing away before you get us all killed. Originally, I was going to use a WordPress plugin to handle Gravatar-wrangling, but when I discovered that one of the features of WP-Gravatars made my blog spew green pea soup (or lose its database connection; I forget which), I started poking around for alternative solutions. As it turns out, I didn’t have far to poke: Sandbox, the WordPress theme that serves as the underlying framework for my custom blog theme, had recently released a new version with Gravatar support. Once I had the latest version of Sandbox installed, it was just a matter of tweaking the CSS to style the new Gravatar-enabled comments the way I liked and voila, one Gravatar-enabled blog. If you start browsing through old comments on the blog, you’re going to notice something: most of the people who comment here don’t have Gravatars. ((Or perhaps they have naughty Gravatars and I won’t display them.)) That’s fine; I’m okay with adding a feature just for folks like Jason Penney, Sam Chupp and Cynthia Armistead, especially if knowing that their smiling (or illustrated) faces will show up on my site encourages them to comment more. Should you use a Gravatar? It’s up to you. If you’re worried about your e-mail address being used for nefarious purposes (like flooding your inbox with ads for Lando-enhancement products), consider this: Gravatar is owned by Automattic, the same folks who make the spam-comment-killing Akismet plugin (the very plugin that has backhanded nearly 110,000 spam comments on this blog and kept it from becoming a nightmare to maintain). You think they’re gonna sell your e-mail address to spammers? I was beginning to think my first Bistrip was going to become a self-fulfilling prophecy and that I’d never have an idea for a second strip. Then I started messing around with the editor and trying to figure out what I could do with my avatar. Messing around with the poses let me to my second strip, “Pumped Up” (click image to enlarge). My third strip, “On Originality“, was born from the fear that I would subconsciously steal a gag I’d seen in someone else’s webcomic. The mini-strip (or “meta-strip” or “recursistrip”) was a bit of a pain to create, as there aren’t really any drawing tools or primitives on Bitstrips yet. I had to use the “speed line” effect over and over again for all the lines, and getting them aligned was a chore. I wanted to put some background color into this one, but there would have been no (easy) way to make the margins on the mini-comic white if I had. The script for my fourth strip, “Bigger on the Inside“, wasn’t written until after I had the entire layout finished. I wanted to see if I could effectively create a gaming table that was longer than the one included in the Bitstrips furniture library. Once I had Chris Miller and Miscellaneous G™ (AKA GoonStar) seated at the table, I decided they should be having an argument, much to the dismay of the other gamers at the table. Special guest star: Jason Penney. In retrospect, I really wish I’d kept the background color the same in all three panels to promote the idea that everyone is sitting at the same table. EDIT: I published a new version with a consistent background color across all three panels. Yes, it bothered me that much. EDIT (again): I just published the final version of this strip. I found a bigger table that allows me to put together a proper-sized gaming group (four players plus a Game Master). This allowed me to do the strip in two panels instead of three and add a new guest star, SambearPoet. I also tweaked the expression on my face a bit; I figured two adjacent characters with closed eyes wasn’t a good idea. I’m leaving the second version here for posterity and comparison.